Borussia Dortmund must keep hold of boss Jurgen Klopp if they are to challenge Bayern Munich, says Tottenham assistant coach Steffen Freund. Dortmund are 20 points adrift of the Bundesliga champions, who also won last season's title by a huge margin. Playing career: Klopp was a one-club man and spent his entire 13-year playing career with Mainz, largely in Bundesliga 2. The striker-turned-defender made 325 appearances - more than anybody else in the club's history - between 1989 and 2001. 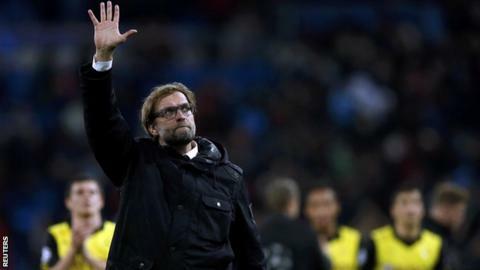 Managerial career: Klopp took over as Mainz coach on 28 February 2001 and, three years later, led them to the Bundesliga for the first time in their history. But, after relegation back to the second tier in 2007, Klopp could not lead them to an instant return. He joined Dortmund in 2008, replacing ex-Germany midfielder Thomas Doll. But ex-Dortmund star Freund, 44, does not think closing the gap is out of the question - if they hang on to Klopp. "With him the team grew into the best team in Germany. I think he can do the same again," he told BBC World Service. Klopp, 46, has been continually linked with a move away from Dortmund, including to English sides Arsenal and Manchester United, despite signing a new two-year contract in October. The ex-Mainz manager has transformed the fortunes of the eight-time German champions since replacing Thomas Doll in 2008. Dortmund finished in the bottom half of the Bundesliga under Doll, before Klopp led them to successive top-six finishes and then back-to-back German titles in 2011 and 2012. He also guided them to last year's Champions League final where they were beaten by Bayern at Wembley. But they have struggled to keep pace with Bayern on the domestic stage in the past two seasons, with the Bavarians winning consecutive titles in record time. Last month, Pep Guardiola's team were crowned German champions for a 24th time with seven matches to spare - beating last season's triumph by a game. "Jurgen Klopp is the most important person at Borussia Dortmund," added Freund, who played for Dortmund between 1993 and 1998. "They had been involved in the relegation zone, or in mid-table, until he arrived. "I think he can do the same again with young players like striker Marvin Ducksch and left-back Erik Durm. They have options and good players coming through." But Dortmund's recent failure has been compounded by their two brightest stars agreeing to join Bayern in the past 12 months. Germany attacking midfielder Mario Gotze, 21, moved to the Allianz Arena for a Bundesliga record fee of £31.5m last year, while Poland striker Robert Lewandowski, 25, will make the same move when his contract expires this summer. And ex-Germany international Freund warns the Bavarians' cherry picking of their rivals' talent will continue. "Bayern are the strongest team - financially too - and everyone knows that," added Freund. "So that's why Gotze and Lewandowski have gone - and this will happen again."